Number three in my installment of gifts from the kitchen is a variation of an old stand-by--rich chocolate-y fudge. This particular recipe is by far one of the easiest recipes for quick fudge that I've ever run across. The basic fudge has only three ingredients, but it lends itself to any number of variations. Grease a 9 x 9 pan--I lined my with foil and sprayed with cooking spray--you could probably use parchment paper, as well. Combine chocolate chips and sweetened condensed milk in a microwave safe bowl. Microwave 2-3 minutes, stirring after every minute, or until chocolate is melted and the milk is incorporated (this picture is after 1 minute) I stirred again at 2 minutes and cooked it an additional 30 seconds just for good measure. Add vanilla and stir well. At this point, I decided on an add-in and stirred in about 1/3 cup of chopped pecans. (Next time I'd probably go with 1/2 cup). Pour into your prepared pan and chill for about two hours. Turn out onto a cutting board, peel back the foil if you used it, and it's ready to cut. This made a thin, dark, rich tasting fudge. I used semi-sweet chocolate chips, but I think it would be good with milk-chocolate chips, and probably the peanut butter or butterscotch flavored chips as well. I think it would also lend itself to doing a layered fudge with two different flavors of chips. I packed some of it in this cute little mini-lunch box tin that I bought in the seasonal decorations at Dollar Tree. Besides the ease of this recipe, I liked the fact that the ingredients are items you can keep on hand for anytime, not just during the holidays. Chocolate chips and sweetened condensed milk may not be something you keep on hand in a really basic pantry, but I think most of us have them on hand or readily available, at least. Why not stock up while they're on sale everywhere and surprise your family with this luscious bite of rich chocolate later in the winter, when they aren't expecting it? Maybe you can make your own goodies for Valentine's Day, too, instead of buying "store-bought" candy. 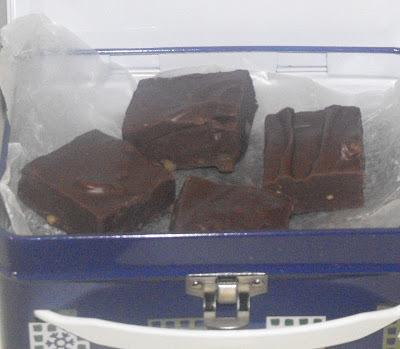 Tomorrow I'll have another easy microwave fudge, but one that makes one that's totally different in taste and texture. Eggless Eggnog--Is That Just "Nog", Then?